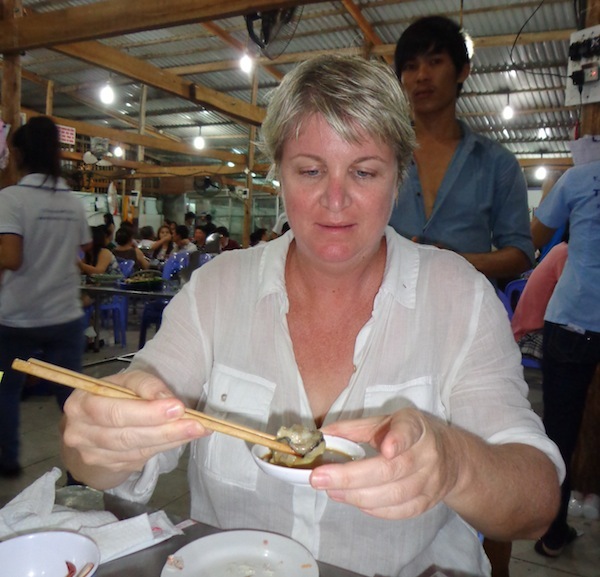 When I challenged Sally from Unbrave Girl to a wasabi oyster duel in a seafood shack in Vung Tau, I didn’t let on that it was going to be my first time as a competitor in any type of duel. I had witnessed many wasabi oyster duels between Darling Man and his crazy friends. Watching a wasabi reaction is very entertaining, especially when both spectators and participants have had a few beers. But I don’t like oysters. And Sally claims to be unbrave, so I was sure challenging her to anything would mean she’d wimp out. She said she liked oysters and wasabi and so was game. I figured I’d just nominate Darling Man as my stand-in and that would be that. But when the oysters were delivered, I decided I just could not be a chicken. Not when the other competitor is supposedly unbrave. “I’m not unbrave when it comes to eating,” she told me in an offhand manner as she chugged a beer and Darling Man prepared two tiny dipping bowls of wasabi and soy sauce. 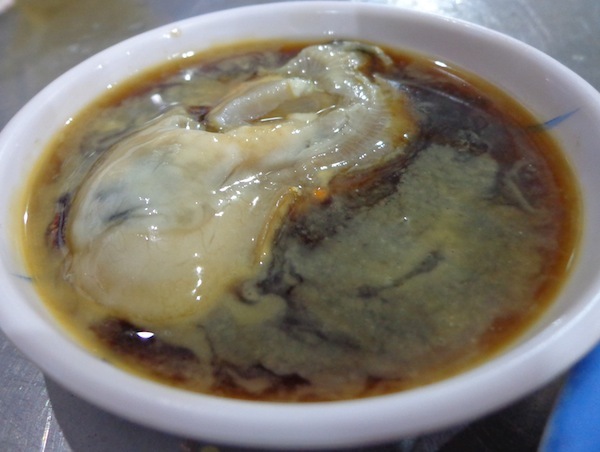 The oysters were prised out of their shells, dropped into the potent dipping sauce and left to marinade for a while. Darling Man went first, gallantly eating half my wasabi oyster. He went red, tears rolled down his cheeks and he gasped for air. It was hilarious. And I forgot to take pictures. Sally went next. She went red, tears rolled down her cheeks, she gasped for air and flapped her hands about. It was hilarious. Darling Man took pictures of it on Sally’s camera. When the wasabi vapours reached the delicate tissues of my sinuses, I went red, my eyes filled with tears and I squeezed a napkin so hard a few drops of water came out. Judging by how the spectators reacted, it was hilarious. From my perspective, getting that slippery bugger down was just a huge relief. I couldn’t even taste the oyster. Only wasabi. The afterglow was so good I had another one. You certainly went red, they must have been really hot. The only good thing about Wasabi is it dissipates quickly, but it is horrific when it hits the sinuses! So Sally didn’t front up for seconds? It wasn’t a matter of not fronting up. 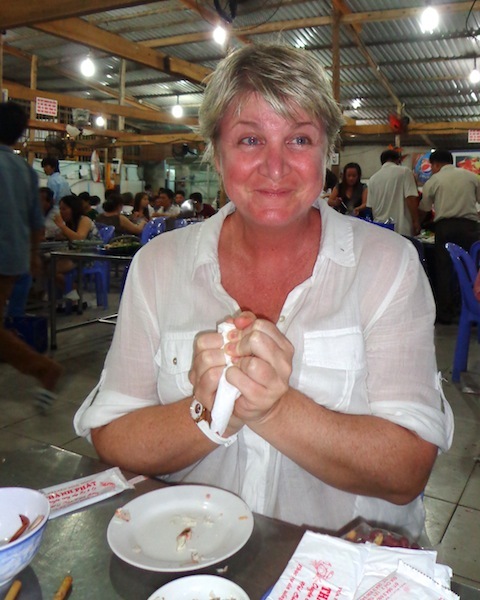 There was crab, fish, prawns and clams to eat as well and she just didn’t get around to the last half-oyster. So I technically lied when I said I had another one. I really had another half-one. They are very big oysters! Because the wasabi meant you couldn’t talk for 45 seconds? I think your mouth will get over it. Mine did. oh I feel ill just at the words ‘oyster’. Add wasabi in … you should have challenged me! I would have taken one look at that plate and chickened out!!! Love the photos, you certainly went red. Trust me, you can’t taste any oyster at all. Oyster-lovers would not like this dish, I don’t think. 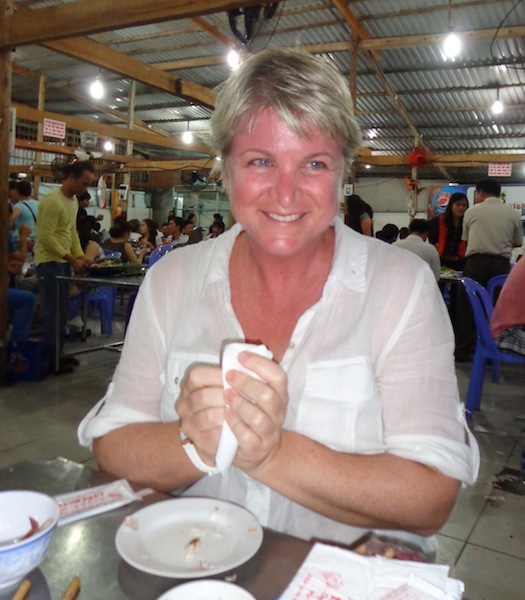 The first time I saw it I was so surprised to find wasabi in Vietnam. And it’s the same Japanese brand of wasabi that’s sold in Australia! Haha, I love both oysters and wasabi, but I can’t say I’ve ever had the two combined. The sting of wasabi is so harsh, but it’s so addictive too delightful at the same time! 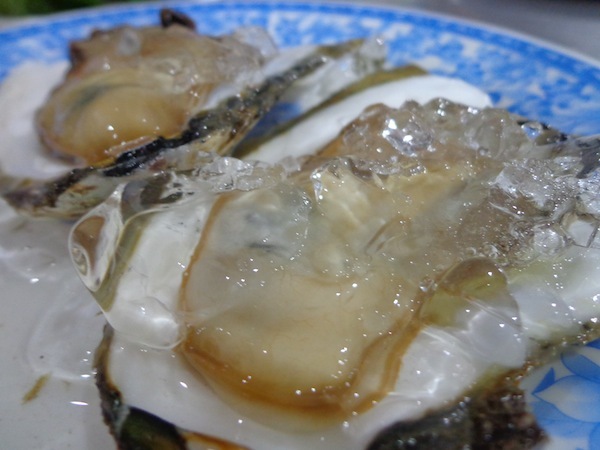 If you come to Vietnam, I’d be happy to take you out for wasabi oysters. I think my dueling days are done, though. Darling Man might be up for it, though. He’s a veteran wasabi oyster dueler.